The all new Valken V-Max loader is finally released to the public. 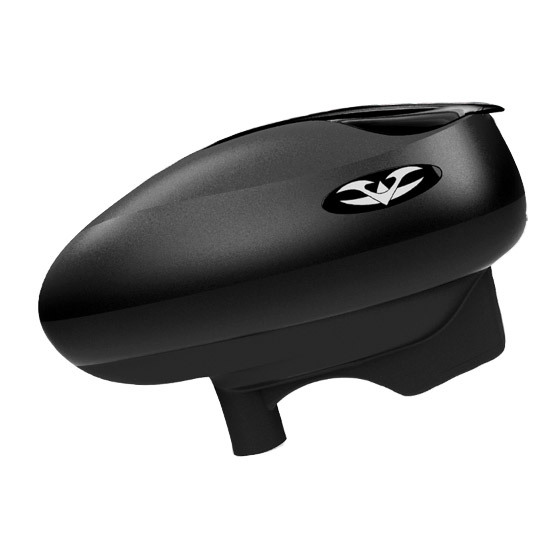 The V-Max hopper has been in the works for the past 24 months and has finally reached a point of perfection! Weighing in at under 1lb with batteries installed, the Valken V-Max Loader is one of the most light weight and compact paintball hoppers to ever hit the market. With a 220 round paintball capacity your loader will easily carry enough paint for you to pack a solid punch on your enemy. The Exalt tank cover is one of the lightest weight and most comfortable bottle covers on the market. 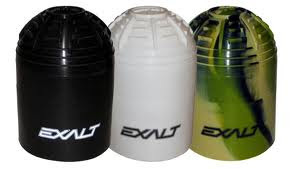 Priced at only $17, the Exalt tank cover will keep your bottle protected and looking good on the paintball field. Made from a very pliable silicone-like material, the Exalt cover can easily fit most size tanks with very little effort. Available in 5 different colors, you can have the tank cover that you want to match the rest of your paintball equipment. This is a must have paintball tank cover for any paintball player that is serious about his gear and serious about the sport. Order your Exalt tank cover today and dont look back! The entire paintball chest protector industry has been quickly evolving over the past 5 years. Before 2008, the only paintball chest protectors on the market were made out of hard and uncomfortable material that you would wear over your jersey, shirt or sweatshirt while playing. In 2008 the Empire paintball chest protector was released and revolutionized chest protectors from all manufactures. 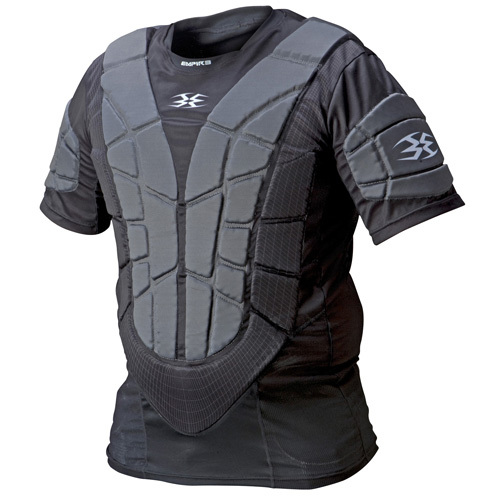 The T-shirt like fit and materials made the Empire chest protector the first to be comfortably worn under your jersey, provide protection and increase bounces. Now when you look at the current 2011/2012 paintball chest protectors you find this in every one of them. Some of the main paintball chest protector manufacturers include Empire, Dye, Proto, Planet Eclipse, Redz, Gen X Global and Valken. If you want to keep your body in good shape and cut down on the bruises then grab yourself a paintball chest protector today. If you are looking for an Empire paintball jersey on sale then check out this sale. 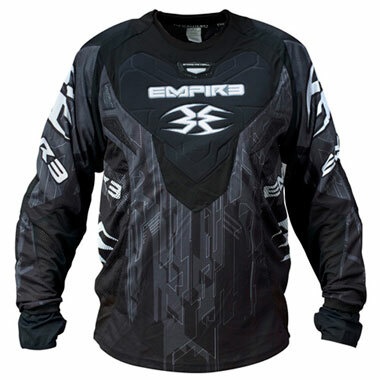 We just came across a huge price drop on all 2011 Empire paintball jerseys. The 2011 Empire paintball jerseys come in either the standard Contact style or LTD style and both of them are available for a great price. While you browse the great deals of the 2011 Paintball jerseys, check out all of the matching pants and gloves so you can look the part on the field. - Engineered mesh panels that can cut the amount of fabric required in a jersey. This technology lets our designers incorporate passive cooling into our jerseys without adding the seams of a traditional mesh panel. These panels create a natural flow of heat away from the body. - Nylon slider forearms incorporate strategically placed 860D nylon on the wrist and elbow to protect your jersey when you are zipping down the snake. - Built in articulated 5mm elbow pads built into the jersey, with a stretch panel above it to move with you and a Kevlar patch to stop any wear. - Perforated Clarino leather thumbhole loops on the cuffs to help keep the jersey in place when you dive and protect your palms for those that refuse to wear gloves. - High output mesh venting down the sides that wrap-around the torso. Being hot and uncomfortable is nobody's idea of fun. We vent the hot zones for you, you just worry about winning. While you shop for your new paintball jersey, be sure to check out the huge selections of paintball pants and gloves to match your new jersey.